“We never saw them coming”…. NINTH CITY BURNING – now available on Audio! 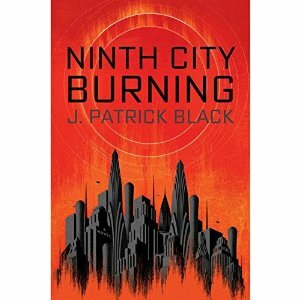 Thrilled to be a part of this very cool multi-voiced audiobook, Ninth City Burning, written by the incredibly talented J. Patrick Black and published by Penguin Random House. I had so much fun portraying the quirky, always outspoken inventor Kizabel and her alter ego or “instara” (a.k.a. spectral assistant) Lady! Set 500 years in the future after an alien attack on planet Earth, suddenly Earth is at risk once more. A select group of 7 individuals come together from unique locations around the globe, each needed for their rare talent, if they have any hope of saving the planet. Written from various perspectives, all in first person, Black has created wonderfully rich characters that are a joy to portray. Ninth City Burning is now available on Audible and at Amazon.com. This entry was posted in Audio Books, Narration, News, Voice and tagged Ninth City Burning; J. Patrick Black; Science Fiction; Penguin Random House; Susan Hanfield; Audiobook; Sci-Fi. Bookmark the permalink. ← Engage! The Fifty-Year Mission: The Next 25 Years – is now on Audio!